Jessica York, PhD research student at UN, would like to invite research staff and students to her Transfer Seminar “The Use of the Aqua-Treadmill in Equine Rehabilitation and Training“. Jessica’s seminar will take place on Wednesday 19th November 2014 from 9:00 – 10:00am in M2, HE Block, Main Site (Gate 2), Moulton College. 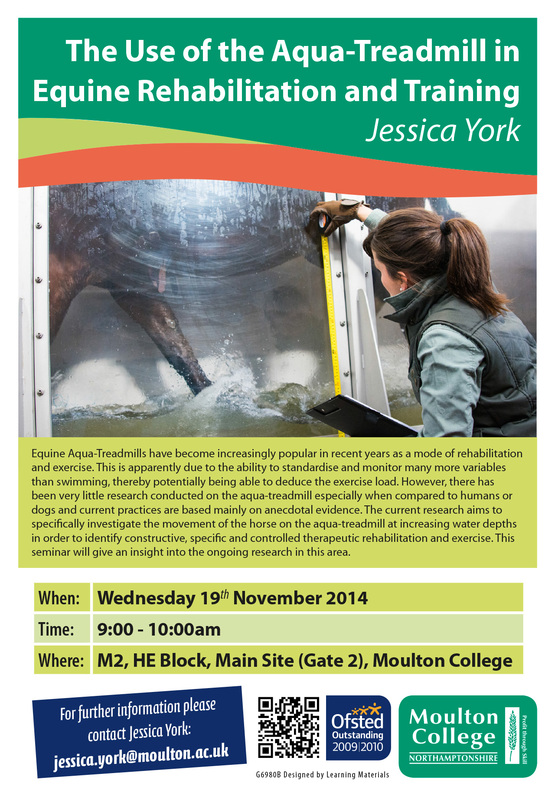 The seminar will give an insight into ongoing research in the area of Equine Aqua-Treadmills and aims to specifically investigate the movement of the horse on the aqua-treadmill at increasing water depths in order to identify constructive, specific and controlled therapeutic rehabilitation and exercise. Posted on November 5, 2014, in Events, School of Science and Technology and tagged Aqua treadmill, equine, Jessica York, Transfer seminar. Bookmark the permalink. Leave a comment.